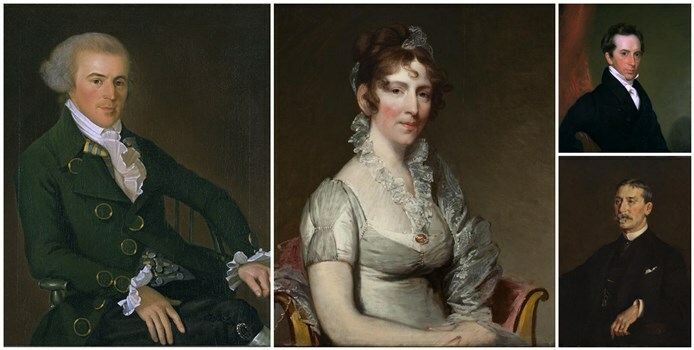 Stephen Salisbury I (left), Elizabeth Tuckerman Salisbury (middle), Stephen Salisbury II (top right), Stephen Salisbury III (bottom right), images courtesy of the Worcester Art Museum. Salisbury Mansion was built for the merchant and gentleman farmer, Stephen Salisbury (1746-1829). He reluctantly moved to Worcester from Boston at the age of 21 in 1767 at his brother Samuel’s insistence that he open a branch of the family business. When the venture proved a success, Samuel encouraged him to buy land and build a proper house and store. Samuel suggested he make them separate entities, but the young bachelor decided to keep everything under one roof and thereby eliminate the need to dash from house to store to meet the country ways of his customers. In 1797 Stephen married Elizabeth Tuckerman, also of Boston, a young lady 21 years his junior. He was 51 and she was 28 and the daughter of one of his business associates. They had three children, with only their son Stephen surviving to adulthood. Stephen Salisbury II (1798-1884), a Harvard graduate, enjoyed a brilliant career as a gentleman farmer, industrial developer, leader in civic, cultural, and political affairs, world traveler, and all-around Renaissance man. The Salisbury line in Worcester ended with Stephen Salisbury III (1835-1905), also a Harvard graduate. Like his father, he became a prominent leader in cultural and community affairs in Worcester. He remained a life-long bachelor, reportedly preferring the company of his horse to many of his acquaintances. At his death, Stephen left his substantial fortune to Worcester civic, cultural, educational, and health care organizations. Learn more about the inner-workings of one of Worcester’s most dynamic and prominent families when you visit Salisbury Mansion.